Do celebrity endorsements make a difference? 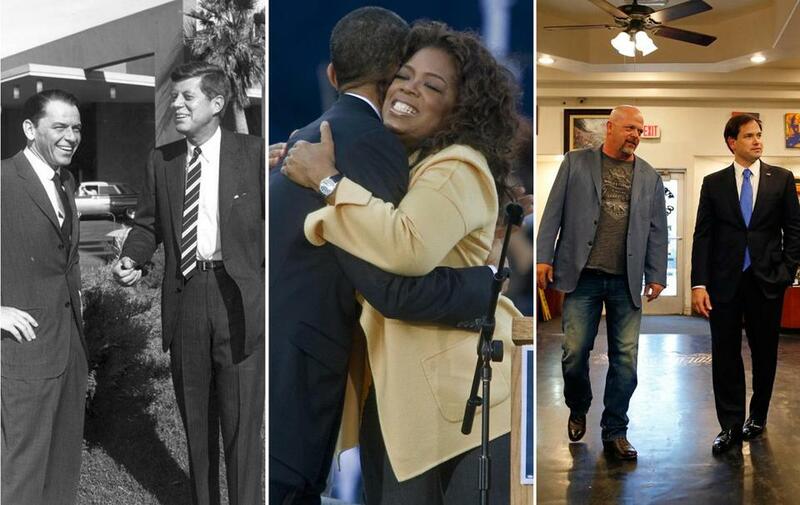 From left: Frank Sinatra and JFK; Barack Obama and Oprah Winfrey; and Rick Harrison and Marco Rubio. There was a time when celebrities who got involved in politics captivated the nation. Al Jolson sang on the stump for Warren Harding during his 1920 bid. The impossibly chic Rat Pack backed John F. Kennedy in 1960. And in the 2008 contest, Oprah Winfrey’s support of Barack Obama helped legitimize the first-term senator and lift him above the competition. But as the 2016 presidential campaigns roll out their VIP backers, with press releases suggesting that voters should be swayed by the endorsements of Anchorman, the Incredible Hulk, and a guy on a show called “Pawn Stars,” it’s growing clearer that the punch these announcements once packed is diminished. 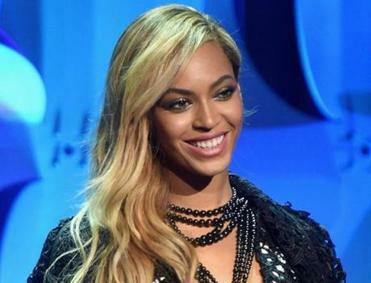 All manner of celebrities are encouraged to endorse candidates for president. Do you know who’s backing whom in the 2016 race? So far this cycle, celebrity influence on the political narrative has proved fleeting, experts suggest. Maybe that’s because nearly everyone has a brand these days, thanks to social media. The public zone is flooded with scene stealers, famous and not so. So when actors Will Ferrell and Mark Ruffalo (Anchorman and The Hulk, respectively) endorse Senator Bernie Sanders of Vermont, and Rick Harrison of the History Channel’s “Pawn Stars” supports Senator Marco Rubio of Florida, and Beyoncé and Carole King pledge their votes to Hillary Clinton, and former quarterback Brady Quinn stumps for Jeb Bush, does it matter? And how? The impact of these public figures, researchers say, is — or can be — threefold. They can draw more people to events and rallies, help with fund-raising appeals, and, as Cobb suggests, create a buzz in the media. The latter can be especially important for younger voters who might not be plugged into the day-to-day scraps among the candidates about policy but might care who rapper Ja Rule likes for the nation’s top job (that’s Clinton, for those in the know). Some researchers see value in endorsements during primary contests, in particular, as voters weigh the sometimes narrow policy differences among the candidates seeking their party’s nomination. That proved true when Winfrey campaigned for Obama. Her endorsement was meaningful because Obama and his chief Democratic 2008 rival, Clinton, weren’t far apart in their beliefs and values. Also, of course, Winfrey told the public it was OK for a woman to choose the history-making candidacy of an African-American over the history-making candidacy of a woman. And finally, and perhaps most important, Winfrey hadn’t been politically active previously. She wasn’t a frequent endorser, someone — like movie star and progressive activist Susan Sarandon, for example — who reliably endorses presidential candidates and whose support conveys a set of implicit policy beliefs. “No one celebrity right now has the power Oprah had at her peak,” said Craig Garthwaite of Northwestern University’s Kellogg School of Management, who studied the effect of her endorsement. 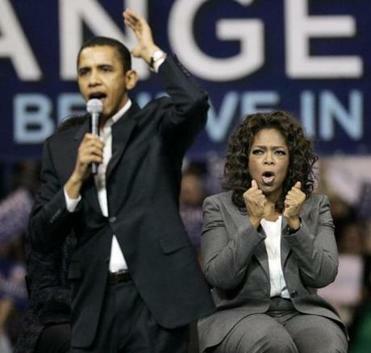 Then-Senator Barack Obama spoke at a rally with Oprah Winfrey in 2009. Garthwaite and colleagues concluded that Winfrey — who had sway with educated white women who were more likely to be Clinton supporters — brought a million votes to Obama that he wouldn’t otherwise have had. A surprise endorsement might be the only other type that could really move votes — though experts were hard-pressed to name one. That would be like if Bono endorsed Bush, Garthwaite suggests. Improbable to believe, perhaps, but such a move might make U2 fans pause, at the very least, to consider the Republican. Celebrities can also say things about other candidates for office or their big money donors that the candidate would never. See comedian Sarah Silverman’s off-color introduction of Sanders at a recent rally in Los Angeles — watched on YouTube more than 95,000 times and counting — for proof of that. Meanwhile, it doesn’t appear that sheer volume of celebrity support conveys meaning in the political marketplace, according to researchers. So when Sanders, a Democrat, released a list last month of 100 or so artists supporting his bid — from Danny DeVito and Belinda Carlisle to musicians from Phish and the Red Hot Chili Peppers — what was he hoping to accomplish? “Bernie has talked about a grass-roots movement and a political revolution and the diversity of the people you see on this list is an example of that,” says Michael Briggs, a Sanders campaign spokesman. Could it also be in some sense counter to Sanders’ populist appeal to have a bunch of wealthy stars singing his praises? Quinn, the former NFL quarterback supporting Bush, is a Florida resident who says he has witnessed Bush’s leadership firsthand. Though he is helping the campaign at events targeted to younger voters, Quinn says celebrities can only add their voices to the process. Voters should rely on friends and family members and co-workers to help them shape their beliefs and ultimately decide on their candidate. It’s worth noting that for the celebrity-endorsement-starved this cycle, among Republicans especially, many believe it’s too early to hear from some of the big names. Clint Eastwood has been awfully quiet. Same for actors Gary Sinise and Patricia Heaton, two politically active conservatives. In fact, the current Republican front-runner illustrates how the nation’s celebrity-fixated culture has not just interceded in the White House contest but begun to hijack it altogether. Donald Trump’s rise in the polls and virtual takeover of the cable media are flummoxing experienced establishment candidates with money and institutional support. It’s worth remembering that Trump, the reality television star and businessman, would not be the first performer to find his way to the White House. Ronald Reagan blazed that trail, of course, though not before holding elected office as the governor of California. Trump has never won office. Still, his deft manipulation of the media and undeniable name recognition have been boosts to his unlikely bid. When contacted, his campaign wasn’t all that interested in peddling celebrity backers. And perhaps with one good reason. “He’s like a self-endorsed candidate in that way,” Garthwaite said.